The capability to manage both drilling and blasting elements of mining and construction projects can make life much simpler for your engineers and project management teams. But executing successful drilling and blasting operations involves a wide range of skills, competencies, and experience. A high degree of precision is, also, required. Our services break the mould with full Rock on Ground services covering every stage of the project from blast design, survey, markout, drilling, and bulk explosives supply to ﬁring of blasts. 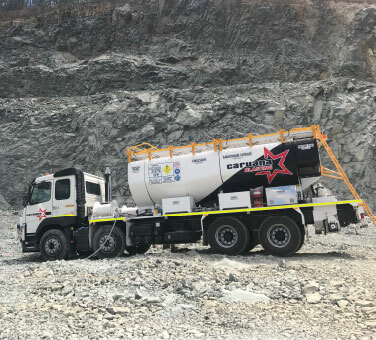 Working with our team of drilling and explosives experts, every step of the drill and blasting stages of your project is managed with greater ease and peace of mind. Partner with us and create a competitive edge for your quarry. We guarantee safe, efﬁcient blasting, predictable results, and fast and reliable delivery; and you enjoy the reduced operating costs. We design blasts to optimise fragmentation, diggability, & productivity and control noise and vibrations; to comply with strict environmental controls. As always, safety, quality and customer support are at the forefront of every solution we provide. Civil excavation projects are complex, heavily regulated, and require experienced heads and hands. There is absolutely no room for error. With our two decades-plus of professional experience, our skilled team brings the peace of mind that your project will reach its desired outcomes, safely, cost-effectively and in a timely manner. Typical challenges like vibration, airblast and fly-rock are minimised or avoided. We also work in terrains and environments where blasting was previously thought impossible.